Leveraging on the support of experienced and qualified workforce, We are engaged in manufacturing and wholesaling a high-class array of Pan Feeding Systems. 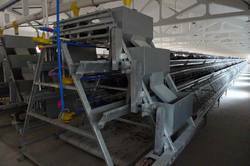 The offered Pan Feeding Systems are able to meet the requirements of patrons as these are based on latest technology. In addition to this, the offered systems are made in-line with international quality norms by using the good quality raw material. Avoids feed wastage during the early rearing period. Auto Pan Depth adjustment to suit day old & grown up birds. Avoids feed contamination due to the mixing of litter in the feed. Auto chick grill ensures minimum feed wastage and in turn increases profitability. Feed shuts slide enables the farmer to shut-off feed where there are no birds. We are offering Trolley Feeding System in customized design and different sizes in order to meet the variegated requirements of our clients. 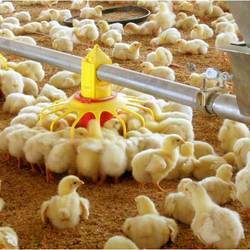 It is manufactured with superior-grade raw material and precisely engineered to fulfill the requirements of poultry farms. The built-in control panel enables to operate the system in auto mode as per the pre-set feeding schedule. Automatic operations as pre-set feeding schedule. It is possible with built-in control panel.